A culture of continuous improvement is one in which employees are encouraged to speak up to make their work better. They know that they are valued, and that their creativity is the driving force behind improving the organization. If you’re reading this now you probably understand the importance of creating a supportive, positive, inspiring culture…but do you know how to do it? The Harvard Business Review has recently published a couple of articles about employee motivation and the cost of a negative culture that I think shed some light on this quandary. First, let’s look at HBR’s analysis of WHY people work. By understanding why people work, you can better understand how to motivate them. And when you understand how to motivate them, you create a positive culture of continuous improvement. This is the holy grail for employee motivation. Employees who are motivated by play find actual pleasure in the work they’re doing. This is the computer programmer who codes at night for fun, or the employee that engages in daily improvement because they enjoy identifying and solving problems. Employees who are motivated by purpose find great meaning in their work as it relates to their sense of identity and their place in the world. This would be the nurse who recognizes that her attention to detail is saving lives, or the employee who recognizes that she is bettering the experience of her customers by improving her daily work. Potential is a powerful motivator for employees who are interested in furthering their careers. While they may not consider the work they’re currently doing “play,” or find a greater purpose in their daily work, they recognize that their current position has the potential to help them eventually get a position that does appeal to their sense of play or purpose. This would be, for example, someone working to improve their department’s efficiency in the hopes of getting a promotion. The other side of the motivation equation is indirect motivation - employees are working because of some other pressure independent of the actual function they’re performing. Employees motivated by emotional pressure are not motivated by the work that they’re doing, but rather, by fear, peer pressure, shame, or to avoid disappointing others or oneself. Economic pressure occurs when people are motivated by the threat of punishment or promise of reward for doing something that does not fulfill play, purpose, or potential. People motivated by inertia work because that’s what they’ve been doing, and they themselves can’t identify a reason other than that for why they work. These indirect motivators are so far removed from the actual task at hand that they reduce engagement, thus negatively impacting your company culture. Have your employees take a survey in which they rate one statement about each motivator on a scale of 1-7 (e.g. “I continue to work at my current job because this type of work will help me to reach my personal goals.”). You can view the full survey here. The idea behind the equation is that the further removed the motivator is from the work that the person is doing, the less it contributes to a positive company culture. This equation has been used to calculate the relationship between employee motivation and customer service ratings in a fascinating way in the airline industry. 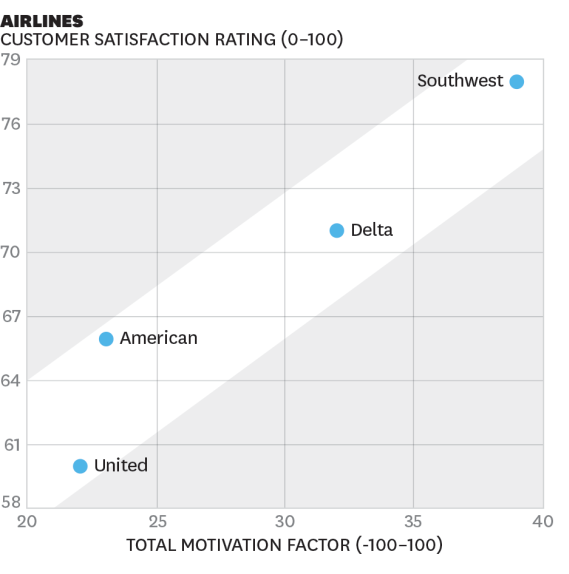 In the graph below, you’ll notice that Southwest Airlines has the highest of both scores, showing that a higher Total Motivation Score is positively correlated with a higher customer satisfaction rating, while United is at the bottom of both scores. If you've ever flown either of those airlines, you've likely seen the impact of those differing Total Motivation Scores. Emotional and economic pressures result in a negative culture rife with stress and disengagement. There’s a myth floating around that an intense, fast-paced, cut-throat company culture in which people are punished when they fail and reap high rewards when they succeed will make you more successful in the long run. What we don’t often consider is the calculable negative costs of that kind of culture. The Harvard Business Review recently published an article debunking it with some cold, hard fact on the cost of a negative company culture. They waste time: The APA estimates that 550 billion workdays are lost each year in the U.S. due to job stress, and studies show that disengaged employees have a 37% absenteeism rate. negative cultures have an 18% lower productivity rate. They have a high turnover rate: Companies with stressed and disengaged employees have a 50% voluntary turnover rate, which costs an average of 20% of the employee’s salary to replace them. They make bad products: Disengaged employees make 60% more errors and defects. They make less money: On average, these companies are 16% less profitable. Foster personal connections between employees, their colleagues, and yourself. Be empathetic toward employees; show them that you value each of them, their differences, and their needs. Go above and beyond to help people. Encourage people to come to you with their ideas and their problems. Empower them to speak up. Check out this post from Cleverism.com for some more ideas of how to improve employees' job satisfaction. Download this free eBook for specific actions you as a leader can take to create a positive culture of continuous improvement.